The newborn session will take place at your home once mom and baby have recovered from delivery and are ready for visitors. Newborn sessions start at 11 am so the family can ease into the day and the baby can take a nap. At this time of day, your home should be filled with light. Most sessions take about three or more hours. This allows for feedings, diaper changes, and any fussiness. Our time together will be very casual and relaxed. I am really good at waiting and will allow for as much time as needed to get the shots. The majority of newborn sessions take place in the nursery. Many parents put so much work into the nursery that it would be a crime to not have it documented. Since most nurseries are on the second floor of the home, there is typically beautifully light streaming into the room. The master bedroom as well as the living room are two other rooms that are typically photographed during a newborn session. Having some key rooms tidy will allow me to easily photograph the house without a lot of preparing on your part. In the past, I have even adjusted rooms that were being used primarily for storage because the light was the best in that particular room. Don't worry, that just means I will be moving some items to another space so we can use a select portion of the room. No need to make sure your entire house is immaculate. There has been many a time that I have moved a huge pile of laundry or a stack of toys, and nobody was the wiser. 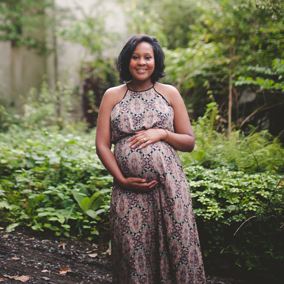 Many families add on a mini maternity session to their newborn session; this is called the Belly to Baby Collection. • An in-person viewing session where you will see your gallery images in a slideshow set to music. Aftewards, you will review your images as 4x6 printed proofs, which will allow you to narrow down your choices and make selections. I will walk you through the ordering process and help you make decisions to help integrate the images into your home. See more adorable babies in the following blog posts.